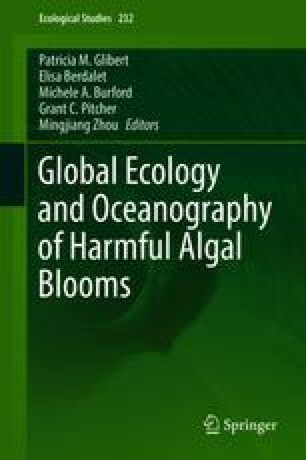 Coastal systems partially surrounded by land such as coastal embayments, estuaries and fjords have characteristics that affect the development of harmful algal blooms. These include stronger links between the water column and bottom sediments, a limited exchange with offshore waters and greater cell retention. Sub-mesoscale and high-frequency processes are particularly important physical factors that influence pattern and persistence of HABs in coastal systems. Coupling with benthic nutrient fluxes or seed banks from the bottom is enhanced as the degree of physical robustness of these systems decreases. Intraspecific diversity is important for many HAB species, but tools are needed for in situ identification. Alternative metabolic strategies, such as mixotrophy or reliance on organic nutrients and allelochemically mediated species interactions, can play a critical role in the development of HA blooms in such systems. This is a contribution of the GEOHAB Core Research Project on HABs in Fjords and Coastal Embayments. Support for preparation of this manuscript is gratefully acknowledged within the PACES II Research Programme (Topic II Coast: WP3) of the Alfred-Wegener-Institut, Helmholtz Zentrum für Polar- und Meeresforschung under Earth and Environment, Helmholtz Gemeinschaft, Germany.